Oncorhynchus keta just doesn’t get much respect even though the chum is Alaska’s second largest salmon, exceeded in size only by the king. Unlike most other salmon, chums frequently spawn in rivers as far north as the Chukchi Sea, providing an important component of the Arctic food chain. And after a long, dismissive history in the commercial salmon industry, its popularity as a food fish has started to climb, especially in Asian markets. Chum and coho salmon are slightly less red than sockeye. All three species are represented here, along with black rockfish. Part of its public relations problem begins with its name. Most of us think of chum as the ground up bait saltwater anglers toss over the stern to attract more desirable game fish. In fact, the name “chum” derives from an indigenous Native term for “marked.” Alaskans like to give salmon regional names, which is why the fish known to the rest of the world as sockeyes and coho are reds and silvers up north. Chums are commonly called dog salmon in Alaska, in reference to the spawning male’s exaggerated, canine teeth. Since the idea of eating chum or dog is unappealing to consumers, marketers have tried to rebrand them more attractively as keta or silverbrite salmon. Few Alaskans outside the fishing industry are familiar with these terms. Like all Alaska salmon, chums begin life as eggs in fresh water. Their smolt out-migrate to salt water faster than other salmon and spend two to four years growing to maturity at sea. Chums demonstrate a spectrum of extremes when they return to complete their lifecycle. Most make shorter freshwater spawning runs than other salmon, and in Southeast Alaska I’ve seen them on reds so close to the sea that their backs were out of the water at low tide. In contrast, chums returning to the vast Yukon drainage travel upstream for hundreds of miles. For residents of the upper Yukon, chums have always been an important traditional source of subsistence nutrition. At sea chums are seldom caught on rod and reel, probably because they feed more on small crustaceans and jellyfish and less on baitfish and squid than other salmon. But from a recreational angler’s standpoint, chums in fresh water should have it all: size, strength, jumping ability, and willingness to strike lures and flies aggressively. Nonetheless, anglers seldom target them, at least in part because of their marginal reputation on the table. 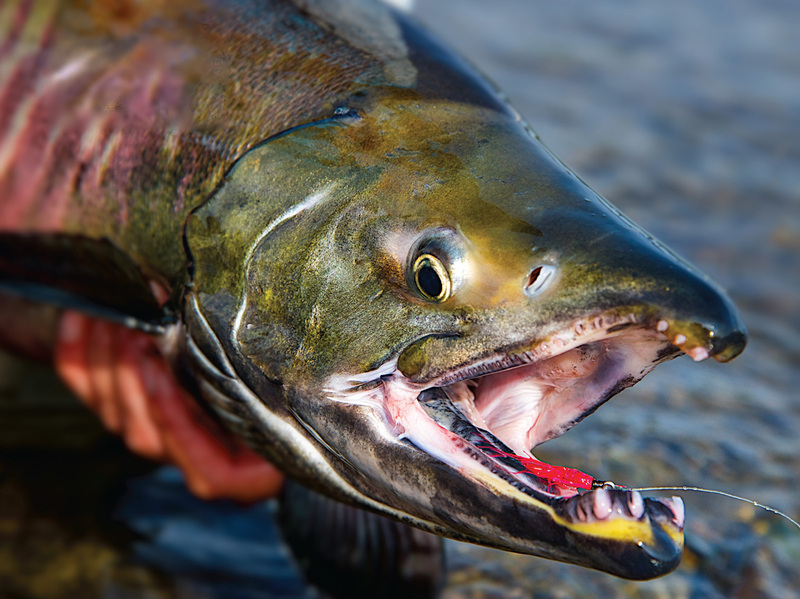 Historically, chums have been the least valuable salmon in Alaska’s commercial fishery. Their flesh is paler than that of other salmon (most consumers expect their salmon to be red), and they have a lower fat content. However, recent trends in culinary preferences herald changes for chums in the commercial market. As a kid growing up in the northwest, friends introduced me to sushi long before its widespread popularity. I seldom ordered salmon roe in restaurants, probably because I had just cleaned too many salmon. My true introduction to red caviar (ikura in sushi bars) came years later during exploratory trips to the Russian Pacific coast, where we often camped beside rivers full of chums. Rations were scarce, but as always, I’d brought my fly rod. Whenever I landed a hen, our Russian friends would pounce on it and strip the roe. Caviar preparation consisted of sprinkling salt on the eggs and rolling them in a few pages from Pravda. It was delicious, and the rest of the world is now discovering what I learned from necessity. Light and delicate, keta roe has become the first choice for many ikura enthusiasts, helping the chum acquire new value in the Asian market for Alaska salmon. The chum is a hardy fish uniquely adapted to its complex northern environment. Perhaps the time has come for us to accord it the respect it deserves. A former resident of the Kenai Peninsula and southeast Alaska, Don Thomas now divides his time between rural Montana and southern Arizona. He writes about the outdoors for a number of publications.